Exposure: L = 180 min. - Red & Blue = 120 min. each - Green = 100 min. 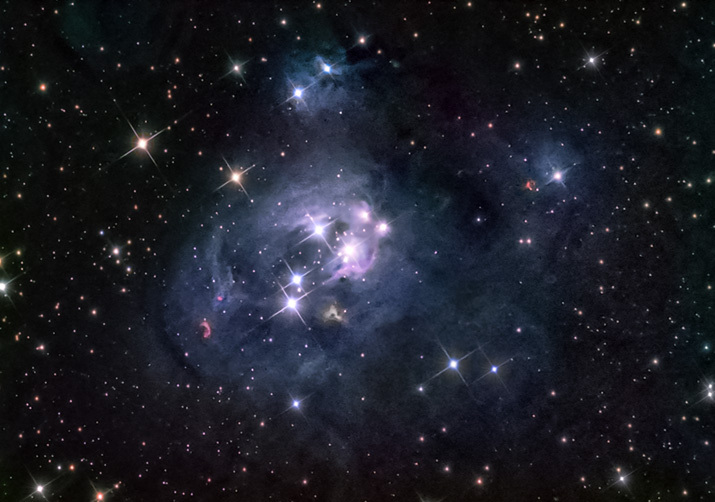 NGC 7129 is a reflection nebula illuminated by a very young open cluster of stars. The nebula and cluster are located in the constellation of Cepheus the King approximately 3,300 light years distant. Current astronomy surveys indicate the cluster is populated by more than 130 stars. The majority of these stars are estimated to be less than a million years old. The center of the nebula has been "blown out" by radiation and stellar winds from large, very hot, newly formed members of the cluster leaving an irregular bubble within the surrounding nebula. The dust on the surface of the bubble is being heated by very intense radiation from the young stars. This hot, glowing, dust is the source of the rosy pink color evident in the image. Much of the structure of the nebula is not visible to optical earthbound telescopes but is readily observed in the longer infrared portion of the spectrum using the Spitzer Space Telescope. Dr. Robert Gendler authored a very complete and detailed description of this remarkable celestial object. It may be viewed here.